The small towns of the Big Bend are separated by distance due to the need for ample wide open spaces to display our incredible scenery. Happily, we are connected by an excellent series of highways, originally worn into the sand and rock by explorers, cowboys, Apaches, Commanches, trappers, prospectors, the cavalry, and the occasional Texas Ranger or sheriff. 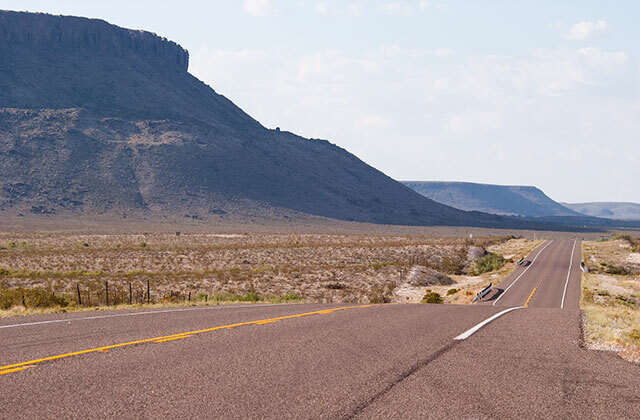 Lined with classic western scenery: deserts, mountains, meadows, wildlife, and even the Rio Grande, our highways evoke their past, but the trails of the wagon train, cattle drives, and railroad have given way to pavement traveled by musicians, tourists, historians, artists, astronomers, writers, archeologists, and — even now — cowboys. We have the straight kinds of roads, and the curvy variety, going both up and down, but they’re long. A word of advice. Get gas when you can. And go to the bathroom. A word of warning. Be vigilant, for others use the road, too, — deer, antelope, wild burros, javelinas, buzzards — and the occasional Texas Ranger or sheriff.